Climate change: have we reached the irreversible stage? | Watts Up With That? Climate change: have we reached the irreversible stage? The earth is in a crisis. Al Gore says so. MANILA, Philippines – Planet earth is in a crisis. The earth’s temperature is rising, the icecaps are melting, the ecosystem is in distress, and time is running out. At the SMX Convention Center Tuesday afternoon, former US Vice President Al Gore detailed how the climate is changing in Asia and the rest of the world. “We’re changing the atmosphere primarily through the burning of fossil fuels,” said Gore. This results to higher CO2 levels and rising temperature. he said. Glaciers are melting, and with the seven major rivers of Asia (which include the Mekong in Vietnam and the Yangtze in China) originating from one piece of ice, the Himalayan glacier, Asia is experiencing flooding like never before, as do other parts of the world. But with rising temperature come droughts too. Gore pointed out record historic droughts in China and Mexico, among other places. This results in a shifting in ecological boundaries, affecting wildlife and amphibians, which are diminishing. The coral reefs are not exempt. “The coral reef is an ecosystem in distress,” said Gore. “We are witnessing a collision between our civilization and the earth,” he said. Gore added that this is due to three factors: population explosion, scientific and technological revolution, and our way of thinking. June 9, 2010 in Alarmism, Ridiculae, Uncategorized. What one sided reporting. They point out that the world as a whole is warming up and temperatures are rising. But they forgot to mention that it is only the majority of stations that are warming up, and that the Beeville station is not warming up. The media should present all the facts. Al Gore lecturing on morality? Well he has it right about the profound effect on future generations. They will be broke if the cap and trade bill goes through. And let’s not forget that the earth’s mantle is about a gazillion degrees a few miles down. Why would any rational, informed adult pay to hear this charlatan speak? The “science” presented in his books and his movie have been thoroughy debunked. There has been cooling in the earth since 2001. I don’t know where you get the data that the earth is now warming. Was it James Hansen? It is exceptionally one sided reporting. So he’s still at it! Should we be surprised? It is the Goracle’s duty to proclaim, is it not? To remind us of the catechisms on the Higher Truths of Global Warming, lest the Deniers and Skeptics temp us to doubt the verity of the Tipping Point and the urgent need for abnegation and self-flagellation with Cap and Trade, and Indulgence by Carbon Credits and Offsets; lest we sin by consuming the Evil Oil and the Dire Blasphemy of Coal; lest we forsake the imperative of Saving the Earth in the Name of the most holy Gaia. And here you thought the most Ennobled by Nobel and Hollywood Goracle had retreated to one of his minor palaces, cowering before the Heretics shouting “Climategate!” No, he braves the storm of doubt and heresy to appear before his acolytes and remind them of the undying truth of Anthropomorphic—er, Anthropogenic—Global Warming, manifest in its essential Duality as Climate Change. All hail the Magnanimous Goracle and his Eternal Hockey Stick! Donations welcome. Will the warming alarmist nonsense ever end? It appears not. I suspect with the end of his marriage he’ll become even more engaged in his activism to fill the void. Tipper’s not going to be around to keep him in check, so it’s Gore Strikes Back. Kinda like Rocky movies: there’s always another sequel. excessive windage, hot air and flatulence. Such commonalities gave newpapers a lot of material. Gore – you are a bore. Please go away. You know, For the life of me I don’t know why you post this stuff, Anthony. It’s like kicking puppies. Obviously Tipper has reached the tipping point! Well, he had to go top the Phillipines to flog this story, and it looks like at least one reporter bought it. So, accept it. All “seven major rivers of Asia” come from “one piece of ice,” and its melting fast. Both “wildlife and amphibians” are doomed. And is all very distressing to the coral reef. Phillipines was also where they had that ‘faith healer’ who allegedly stuck his hands into people – without leaving a mark – and pulled out the bad stuff, and all sorts of people bought that one… until it was revealed that he had chicken guts hidden in his hand all the time. Tipper must be so much happier these days. Wasn’t the tipping point reached some time back when CO2 concentrations breached 350ppm? But I do like the 1 and only comment on the article linked, sorta sums it up really IMO. In other words, it’s religion. False religion, at that, as spread by the Profit Gore. Gore will not leave anything good behind him. He couldn’t save his marriage, but he wants to save the world. The emotionally stunted mentality of a teenager. “We are witnessing a collision between our civilization and the earth,” he said. I pick our civilization over every thing else. No cause for alarm, move along. Don’t be fooled by the words, this is only about greedy MONEY, nothing more! Bro, do I detect a note of sarcasm there in your post? LOL. Following a long, cold and harsh winter, Al Gore has come out of hibernation. Was he hiding from the cold truth? Can some one please tell him that it is summer now and that we had a very long, cold and harsh winter please? I think he is mistaking summer for global warming, which is half the truth, because summer causes half the planet to warm up, and the other half to cool down, whicha 6 year old kid would be able to explaibn to Mr. Gore. Can some scientist friend of his please tell him this? In Al Gore’s speech here, as reported, there is something really fantastic: No mention of rising ocean levels. Is it because of the big multi-million dollar villa he purchased just in front of the ocean? Or is it the other way round: He has bought the villa because he is convinced that the oceans are not rising? Why even dignify such nonsense by repeating it? It’s a waste of time. Just do what I now do at ACM with this kind of rubbish: simply ignore it. After AlGorebychov spoke in Copenhagen last year, there were massive blizzards and extended cold periods hitting Europe and North America. Please Al, give Australia a break and don’t come southwards this (Antipodean) winter. I think Brother Gabriel got it right. Brother Michael simply forgot to hit the ‘sarc’ button when he posted. It’s not warming in Beeville, and it’s not warming in Paisley, Or., either! Steve, you won’t win friends among the divorced that way. I can’t speak for divorced people, but I imaging many feel more stunted financially than emotionally. Gore, however, shouldn’t have to worry about the cost of his divorce. Not a lot of coral reefs left to be distressed in the Philippines. They have destroyed them by dynamite fishing. After listening a few times to the man on NPR I am now fully convinced he is a dishonest profiteer. Another factor is the rapid economic growth of developing countries, particularly China and India. I think it inevitable that the U.S. will lose much of it’s lead as an economic power, so it’s important we continue to be a world leader in military strength and in science and technology. Earliest opening in the history of the Snow Farm. Wow, check out the white gold!! After spending several days clearing the road, we finally gained access to the car park – what follows now is a lot of digging! With over 1.5 metres, we are frantically trying to get everything ready for a (fingers crossed) early start to the season. …and Al Gore was still waving to people in Manila like a President elect with his wedding ring. That’s what the Filipino people were really interested about. Well, I was there in Manila in the SMX Convention Center. His is a gret speaker and multimedia communicator. His latest shocking pictures captured the audience. But I will not bore you with too many details here. If you know the facts, you just don’t buy it anyway. Fahrenheid??? He hasn’t removed the Kilimanjaro story (glacier evaporating after climate shift and deforestation, not CO2, Kaser et al….). His slides went straight from the Kilimanjaro glacier and faded into Law Dome, Antarctica, where her started to ramble about ice core records, then the CO2-concentration of today – shocking, you know. Then the power point let the CO2 pillar even more than double one more time. “This is were CO2 is going to be if we continue as now for the next 35 years”. What does he mean? 780ppm in 2045? MIT study “storm intensity +50%. Sept. 2008: “Gustav hit New Orleans again. It didn’t even hit the news”. Guatemala City May 2010. “Sinkhole 100 meters deep opened up”. Then Arctic Sea ice: “This is how it looks like NOW”. The slide shows Arctic minimum ice extend 2007, of course! At the end, Gore praises the (still) President of the Philippines Gloria M. Arroyo for her global warming initiatives [at the expense of the poor…] with battery powered jeepneys. (I didn’t see any) and for the Philippines lead in geothermal power. Well, that’s a good one. But the Philippines stabilized CO2-emissions? I doubt that statistics. Then again: Put a pricetag on carbon…nuclear power can be a solution. The jet-setting environmentalist strikes again. I live in the Solomon Islands, it isn’t just the one sided views expressed, it is the one sided acceptance that we are sinking, that all the islands, atolls, coral reefs, fish, eco systems are in complete failure and without massive amounts of money from the western societies that have caused this we are doomed. Despite numerous and well reviewed papers, as mostly reported in here, which point out the failures and falsifications, the AGW scare machine rolls on. Willis has frequently and intelligently provided hypothesis that explain the interelationship between the tropics and the temperate zones, which I have blatently and frequently plagiarised and had published in the Solomon Star, but the scent of compensation has over ridden any intelligence being applied to this. To have the over puffed charlatan that Al Gore has become still pushing his message of salvation to come once the western world is beggared by reparations, is beyond my comprehension. One of the principal reasons for divorce is one partner spouting BS all the time. Amphibians diminishing? Oh my, I’d better go and tell my garden frog colony that Al Gores thinks the bumper crop of tadpoles currently swimming around in my wildlife pond aren’t enough. What exactly does omnipotent mean, and why is Al trying to thwart Gods will? Can God make a planet so hot that he can not cool it? In reply to Steven Goddard; I always read and appreciate your posts, but I survived a divorce many years ago and, since then, find moral judgements of any divorce (or divorcee) without knowing the facts to be both judgemental and quite silly and tend to diminish those making comments. Some things should remain out-of-bounds for comment. I taught teenagers for many years and found the great majority of them to be amiable, responsible and sensible people, with about 5% of them deviant from the norms of their peer group in some way or other. Because Al Gore does what he does is no reason to cast aspersions about other large sections of humanity. Having said that, I am still mightily relieved that Al Gore never did get his hands properly on the levers of power. I hope AGW really crossed an irreversible point. It is beyond irreversible point of lost confidence and the irreversible changes will continue fast. The only crisis here is in Al’s Carbon trading dream. Gore world – If the real world data lets you down, simply make stuff up and repeat it at every opportunity. I just love the smell of failing investments in the morning. So why is the 2010 year to date temperature in the US pretty normal? Go to NCDC, you’ll see the charts. Much warmer than normal in the NE and across the Great Lakes. Much colder than normal in the SE and colder across the entire Southern states of the US from Florida to California. The May split is west-east. The entire west of the US much colder, the east significantly warmer. Mr Gore wants to look at data close to home. If we have reached a stage in wich AGW is irreversible then we might as well stop research into climatechange and start learning how we should board up our windows & doors at a massive scale. But damn they keep moving the goalposts (again) because we still have about a decade to act. Al Gore is a bit like the kid from next door that keeps shouting that you will be beaten up by his bigger brother unless you hand over your pocket money, the problem is that his bigger brother is only imaginary, perhaps there is a distant nephew, but we don’t know for sure and it is very unlikely that he will come over to beat us up because little Al told so. I wish Gore would concentrate on the over population issue – that at least makes sense. It is not that the Earth doesn’t face dangers, just that overheating from CO2 doesn’t seem to be one of them! Ah. Not just my pond then? I’ve never seen so many. Bumper year. Where are those phenologists when you need them? His investments will only pan out if we get cap and trade. His wife will be getting something out of the divorce. So his expenses are up. Let’s see… expenses up… revenues down… got to do something. He really has been off the radar screen until news of his divorce hit. In another month everyone will have forgotten him. History is not going to be kind to him. But he’ll continue to live a comfortable lifestyle. We won’t hear much of him until he finds a new love interest. Al Gore junior, is so full of himself that were he to take a serious restroom break, the only things left would be his clothes. What is the Carbon Footprint of the Hypocrite Gore’s new $8.5M mansion? It makes me sick to my stomach that poeple give this HYPOCRITE the time of day. But the people just get what they deserve in the end. If all they can be bothered to do is watch football and eat themselves into pototatoe shapes then f*** ’em – the NWO, a whole bunch of Gore like hypocrites, is who will own them, like slaves. If Gore really beleived that CO2 is going to destroy the planet, and if he really cared about destroying the planet, then he would reduce his onw footprint. But as he gets richer and richer and richer and richer fron the carbon tax schemes through the companies he owns, he is increaing his own footprint. He will say he is offsetting. But that is a bit like me being pro population control, having another child, but not donating to African charities on the basis that at least a couple more Africans will die to offest my new sprogs. I.e. let someone else make the sacrifice. It is typical of socialist/communist mindsets like Gore. The problem they have is that eventually they will run out of other people’s money. Yet it doesn’t seem to fall into the global warmist preferred site list – pity as it speaks the truth. Would you listen to a man who has business interests in the carbon market? Would you listen to a theologist / politician who says that the earth’s core is millions of degrees? Would you trust a man who says rising co2 is bad and yet has 6 fireplaces? So much for unprecedented warming. Michael, why are you not more sceptical???? “We can do great things in the world. We have the technology. Don’t tell me we can’t solve it if we don’t put our heads to it,” Gore said. Well, maybe he was misquoted – or maybe he mis-spoke – or maybe I am just not smart enough to understand 🙂 Is he noted for making such comments? I am an US citizen but I am afraid the US is head down the tubes – FAST. A country that is dead broke and is producing no REAL WEALTH, that is manufacturing products or growing food can not afford a “strong Army” The Soviet Union proved that. Once the US stopped providing cheap food they collapsed. At this point the USA is a NET importer of food. We used to be a net exporter. We have less people employed in manufacturing than we did in 1970 and what is left of our industry is foreign owned. Grace Commission Report: Presented to Congress in January 1984. * One-third of all their taxes is consumed by waste and inefficiency in the Federal Government as we identified in our survey. * Another one-third of all their taxes escapes collection from others as the underground economy blossoms in direct proportion to tax increases and places even more pressure on law abiding taxpayers, promoting still more underground economy-a vicious cycle that must be broken. Another major problem is American education. It also has gone down the tubes. I guess old Nikita was right. Remember one of the trio involved with the Carbon Exchange is Mikhail Gorbachev as well as the long time friend of the Soviet Union and Communist China Maurice Strong. I wonder what that makes Al baby. My memory is not all that good, but hasn’t Big Al been saying “in about ten years” for almost ten years? Now click global in extent and something from theSmithsonian Institute [pdf] and tell me that the recent warming is unprecedented as we have been told time and again. Look at how the Arctic might have been 6,500 years. What did they pay him for this speech? How much did it cost to get him to the Phillipines? How many folks went along with him so he could give a speech? How many fancy dinners did he attend with high ranking officials and business folks so that he could lobby them for his causes? I like the little Smiley at the bottom of the page. Nice touch. I tried to clean it off of my monitor then I noticed it was in the page! Sorry Michael Hauber, try this better link from the same site. Honestly, I can’t imagine living my life–as many of these scientists do–in fear of global climate change. What kind of a life are these people living if they constantly roll out of bed every single morning with the thought: “The end is near!”? How terribly tragic. “Al baby”, as Gail Combs calls him, is the outspoken, unhinged and uninformed prophet of the Cult of Anthropogenic Global Warming (aka Climate Change). He invokes spiritualism when he calls upon people to get involved yet the very object of his derision, CO2, is the key to feeding the world’s population–If we’re lucky, foodstuff production will keep pace as the carbon cycle expands. That Gore and his ilk are against it speaks volumes about their anti-humanity, self-enriching theology. Expose it. Fight it. Conquer it. Algore is a false profit. Mr Gore needs to look at data, full stop, but he neither will nor can as it’ll upset his gravy train. Al Gore blames it on global warming. Same goes for Spring as Clinton would has joked. But was this speech peer reviewed? If you thought we were headed for trouble before, wait until the divorce of Al and Tipper is final. The reason Al Gore invokes spiritualism and morality for reducing co2 is because he needs to move away from the shaky AGW science before it implodes, yet needs reasons to reduce co2 other that its ‘warming’ effect. This approach is a crock to most people and will fail because the massive sacrifices will be in the name of spiritualism and morality not cold, hard science. Got to pay the bill don’t ya know!!! I m not afraid of 1000 ppm CO2. What I m afraid of is 200 ppm CO2, or less. The end of the world will not be according to Al Gore’s prophesies. The end of life on this planet will be when volcanoes stop pumping out CO2 gas from their bellies. CO2 inthe atmosphere has a resident life of 15 years according to peer-reviewed scientific studies. Hence, the CO2 we are burning today, the CO2 oozing out of the oceans and the CO2 escaping from the earth’s bowels will all be turned into grass, insects, birds, animals and Al Gores withing 15 years time. So the end of the world will be 15 years after CO2 stops coming out of the planets belly. One of the most harebrained statements ever. a) There is no single “Himalayan glacier” from which the Mekong and Yangtze originate. b) The Mekong ebbs and flows in concert with monsoon season (rain) and dry season (no rain). It has nothing to do with the temperature or with the Himalayan glaciers. c) Flooding of the Mekong has been almost nonexistent for the last 12 years, and no greater than normal for the last 40 years (the Mekong Delta is, after all, a flood plain). Anecdotally, my wife’s family lives less than 10 to 30 meters from the Mekong, and she grew up there. Nothing is abnormal by their accounts. You are assuming they actually believe their own hype. I wonder if it is the hype or the grant money they actually believe in. Mann received $541,184 in economic stimulus funds last June for three years. That does not include the nearly $1.9 million grant from the National Science Foundation is for studying the effects of climate change on the spread of infectious diseases, such as malaria. Thanks Mr.Gore!, we could have not expected less from you, you are the one who has helped more for all humanity fully to understand and comprehend with their whole being, that the scare of Global Warming/Climate Change that you so, intelligently, concocted by you for us, commoners and simpletons of the world, who are so fool of working hard every day of our lives, not like you who manages to live like a King without making any effort, it is a complete non sense. You are doubtless our most distinguished champion, we all sceptics are deeply thankful of your invaluable help for making of Global Warming/Climate Change the most, the biggest JOKE. I think you’ve got your dates all mixed up. You are supposed to post Funnies on Fridays! The Gore is my shepherd, I shall not warm. he leads me beside quiet glaciers. Your cap and your trade, they comfort me. You anoint my head with biodiesel, my cup overflows. And I will dwell in the house of the Gore forever. I would say yes. If Cap and trade or something similar is not passed in the next two or three years, and if we continue with a solar minimum and negative PDO, AMO then the window of opportunity will have passed. I fear those things are all linked. Our current administration wants us to lose our lead in military strength. They would be happier if there were other super-powers to counter balance us. I believe we have largely lost our lead in science and technology. First, we have a broken education system that tries to do anything but education. Second, we have a culture which does not encourage our best and brightest to pursue careers in science and technology. We are also in the process of creating an economic system which discourages innovation and risk-taking. Wow, Al makes it sound really bad. At least he has a good marriage to go home to. The latter is what made or makes America great; the former is why the rest of the world is laughing at us. No. What we are witnessing is a collision between bad politics and good science. What is the climate like now? what have the changes been? What do the models say will happen in the future? Have any changes you have seen been a problem? Does any change look irreversible? But, but… too many are also a sign of the planetary fever. On the bright side, you now have a robust earthquake detection system. Well at least he admits his thinking is dangerous! That would take at least a 12+ deg C rise. Dammit, no more fizzy drinks then $? Can’t we just hurry up and reach the tipping point so he’ll shut up. No wonder his wife left him; she probably got tire of him whispering sweet nothings about the climate in her ear. The way I see it is civilization expanded and transformed territory to serve the civilized people. I wouldn’t call it a “collision” as much as an “aquisition”. On the other hand, I am very much a “nature freak” and feel spiritually nourished when out and about in un-managed places. There is something beautiful about the “untouched” wilderness. I think it is great that the modern version of “western” civilization values wild spaces, so that some land was acquired to be left alone as a service to the people. I know this has nothing to do with “global warming” but rather land use. But the reason I bring it up is because I worry that the warming concerns of Gore are diverting attention away. I follow Stefan in believing that psycho/religious motives are strongly involved in warmism. These include a desire to place oneself among the “sheep” (as opposed to the goats); to adopt a one-up, holier-than-thou, anointed stance vis-a-vis the Other (the mundane, earthly, grubbing, benighted get-and-spender); to have “clean hands” to show to the Lord (at least on the level of intentions); etc. Ah, but he is! Money is not the ultimate goal of the AGW scam, they have plenty of that already. Algore, Prince Charles, Maurice Strong, the Rockefellers, the UN (with its watermelon NGO’s) et al. want to destroy national sovereignty and form their global government for a very specific reason. AGW is supposed to be the means to the end, the end being population reduction. 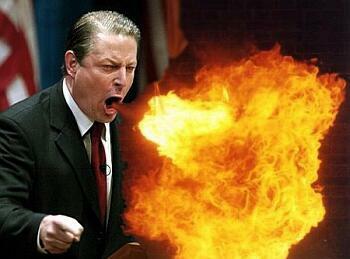 Gore’s Gaia preaching (ever notice Charles does a lot of this too?) is all part of it. I love how accurate these scientists can predict weather and there effects. This year in April we got a fairly large snow storm and the scientist were all happy because they had determined with there hadn’t been enough snow fall over the winter and they were sure that we were going to have a drought. This snow fall might be just the thing to prevent that. I should probably explain that I live in western Canada. Now it is June and the province of Saskatchewan has basically declared a state of emergency because they have had so much precipitation that the farmers can’t get on the fields to plant crops. Here in Alberta, the same thing is happening, we just haven’t declared an emergency yet. The fields have large pools of standing water in them, the ditches either have pools of water in them or the ground is so soft that vehicles sink up to there axles in mud in they go in them. One field near where I work has so much water in it that there are ducks living in it. I’m still waiting for the drought. So Al Gore thinks that “mankind” and their production of CO2 is going to cause GW. What a load of rubbish. The atmosphere has a mass of about 5 quadrillion metric tonnes MT’s (5,000,000,000,000,000,000) CO2 accounts for 0.0383% or 1,915,000,000,000,000 MT’s. The earth produces 97% of CO2 in the atmosphere. Man’s total contribution to that figure is 3% – or 0.001149% = 57,450,000,000,000 MT’s. These figures appear to be very large because of all the zero’s. I will convert these figures to dollar values to make man’s contribution more understandable -I will call the total atmospheric CO2 $100,000, (100% x 1000). Man’s 3% contribution to the 0.0383% total CO2, (0.001149% x 1000) is the equivalent of $1.149c. So $1.15 (rounded up) is going to have a devastating effect on $100,000 of atmospheric CO2 – I think not. Where is fire breathing Al? I was and am roasting in Florida, Georgia and the Carolinas. Al Gore, you are a fraud, charlotan and liar. Everything you say scientifically is either wrong or severely over stated to sell your soap that you are making millions off of at the expense of the public who will get nothing but higher energy bills and taxes that you profit from.